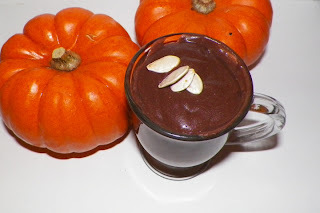 Vegan Chocolate Pumpkin Pudding that's so good my non-vegan teens love it. Also good for pudding lovers who have a lactose intolerance. 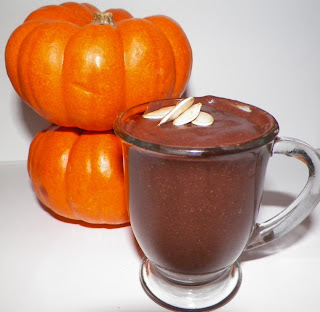 Another plus is that pumpkin and almond milk are both high in vitamin A and this is so much tastier than carrots! 1/4 cup tofu- yes. Tofu. Since this is vegan, it won't have the body and silkiness that an egg offers. Tofu helps! A soft tofu works best. You can skip this if you want soy free. 2 cups almond milk- the first time I made this, I used soy milk, but the almond milk tastes so much better! Blend the tofu, almond milk, pumpkin butter, cocoa and sweetener until very smooth. Cook the mix in the pan over medium until it starts bubbling, whisking to keep the almond milk from scorching. Pour in the cup you set aside, whisking constantly. Keep cooking over a medium heat until it's thickened to your liking. I compare making pudding to making gravy. You use a thickener and cook to let some of the liquid evaporate until you have the consistency you like. For pudding, this takes about 10-15 minutes of cooking and whisking to keep it evenly heated and not let it scorch. Serve chilled, with pumpkin seeds on top for garnish if you wish. The photos are of a tiny demitasse glass cup and little decorative pumpkins.